Local Ecotourism and Sustainability Expert, Bradd Morse, Invited To Speak At World Class Conference In China. 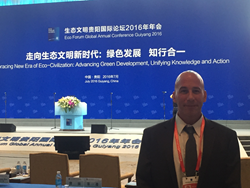 Bradd Morse, President of Canopy Tours Inc., speaks as an expert on ecotourism and sustainability at the Eco Forum Global Conference in Guiyang, China. The eighth annual Eco Forum Global Conference took place on July 9th and 10th in the Guizhou Province of China, a model location of ecotourism in the world’s most populous nation. The forum on sustainable human settlements and tourism was one of the most important thematic forums of the Conference. This forum was a result of the SDG Summit in New York, COP21 in Paris and China’s Thirteenth Five-Year Plan. It addressed tourism planning and design, sustainability in cities, construction and tourism innovations. The success of these forums is due largely in part to the participation of world leaders, government officials, Chinese leaders and investors. The world’s most pertinent and knowledgeable leaders in the field were invited to speak at this event in order to exchange information and experiences, design comprehensive strategies and to learn tools, techniques and best practices to help define the future of sustainable tourism development worldwide. Bradd Morse, President of U.S. based Canopy Tours Inc., attended the Forum at the invitation and request of The Global Forum on Human Settlements. Canopy Tours, Inc. has been building custom, sustainable tourism adventures throughout the world for the last thirty years and is recognized as a leader in the field. Each attraction is custom designed and based on the specific needs of the client, but also considers factors such as environmental and cultural impact as well as the long term sustainability of a project within the surrounding community. The consideration of these complex “hidden factors” can often times determine the ultimate success or failure of a project. Understanding the specific challenges of a nature based attraction, combined with the ability to provide a solid business, management, training and marketing plan has made the company one of the most sought after consulting firms in the industry. In addition to a busy consulting schedule, Mr. Morse’s vast knowledge and engaging presentation style has also lead to more demand as a public speaker to help promote responsible tourism initiatives around the globe. He has recently signed an exclusive contract with The Global Forum on Human Settlements to be the sole ecotourism specialist for China as they continue on their journey towards being a sustainable ecotourism destination.